Store and organize up to 12 drawing rolls right beside your desk with this compact roll file. Each file is constructed of durable corrugated fiberboard in an attractive walnut woodgrain finish. Square compartments are reinforced with plastic molding to prevent tears and snags. 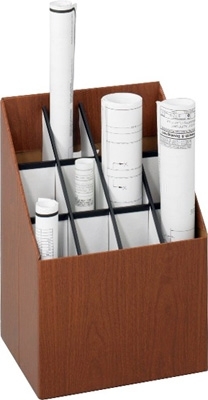 This Roll File unit features twelve 3-7/8" x 3-5/8" square compartments. Easy assembly.